The message appeared in a newspaper personal column on three consecutive mornings: Richard, please make contact. Love Mum, Dad and Rachel. Simple and touching. But nothing in those nine words offers any clue to the tragedy behind them. It is the story of an educated boy from a middle-class family who found fame as the flamboyant inspiration behind one of pop music's most successful new bands. When he reached the top he found he couldn't cope and fell into a destructive cycle of depression, alcoholism, self-mutilation and anorexia. His name is Richey Edwards, 27, guitarist and lyricist with the Manic Street Preachers, four Welshmen with a sizeable cult following. In the words of his anguished father, Richey has "just vanished into thin air". He was last seen at 7am on February 1 when he checked out of the Embassy Hotel in Bayswater, West London. He drove to his flat in Cardiff where he left his passport, credit cards and supplies of a drug he was taking to combat depression. On February 17 his silver Vauxhall Cavalier was found at a service station a few hundred yards on the English side of the Severn Bridge, a notorious suicide spot. Police believe it had been abandoned three days earlier. His disappearance comes at a time when his career was flourishing. The Manics have scored a string of top 40 singles in the last three years-reaching number seven in 1992, ironically with a cover version of the theme from the TV series MASH, in which the line "Suicide is painless" features prominently. They have also released three albums, the first two selling more than 100,000 in the UK. Next month they were due to undertake a 26-date U.S. tour which has now been cancelled. In the Gwent town of Blackwood, Richey's parents Sherry and Graham, who have run a hairdressing salon there for almost 25 years, and sister Rachel, can only sit and wait. 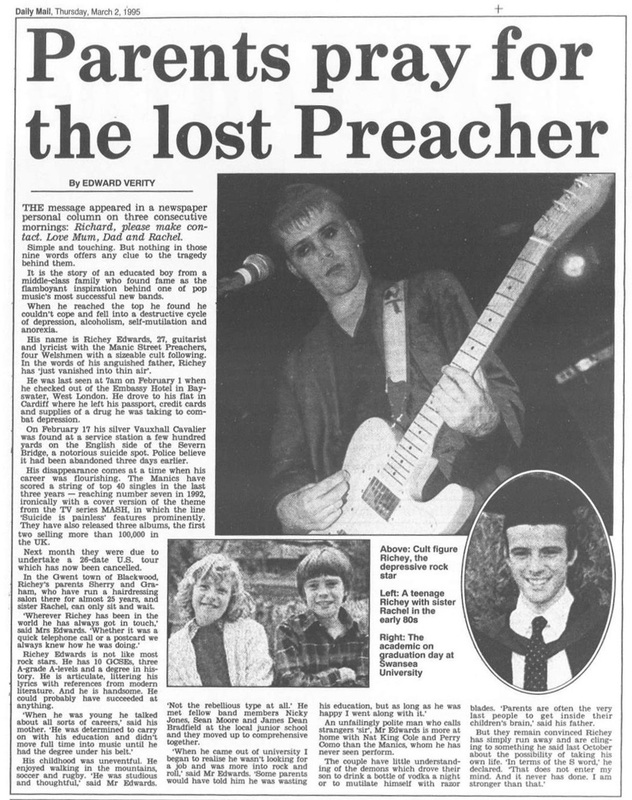 "Wherever Richey has been in the world he has always got in touch," said Mrs. Edwards. "Whether it was a quick telephone call or a postcard we always knew how he was doing." Richey Edwards is not like most rock stars. He has 10 GCSEs, three A-grade A-levels and a degree in history. He is articulate, littering his lyrics with references from modern literature. And he is handsome. He could probably have succeeded at anything. "When he was young he talked about all sorts of careers," said his mother. "He was determined to carry on with his education and didn't move full time into music until he had the degree under his belt." His childhood was uneventful. He enjoyed walking in the mountains, soccer and rugby. "He was studious and thoughtful," said Mr. Edwards. "Not the rebellious type at all." He met fellow band members Nicky Jones, Sean Moore and James Dean Bradfield at the local junior school and they moved up to comprehensive together. "When he came out of university I began to realise he wasn't looking for a job and was more into rock and roll," said Mr. Edwards. "Some parents would have told him he was wasting his education, but as long as he was happy I went along with it." An unfailingly polite man who calls strangers "sir", Mr. Edwards is more at home with Nat King Cole and Perry Como than the Manics, whom he has never seen perform. The couple have little understanding of the demons which drove their son to drink a bottle of vodka a night or to mutilate himself with razor blades. "Parents are often the very last people to get inside their children's brain," said his father. But they remain convinced Richey has simply run away and are clinging to something he said last October about the possibility of taking his own life. "In terms of the S word," he declared. "That does not enter my mind. And it never has done. I am stronger than that." This page was last modified on 15 May 2018, at 09:30.